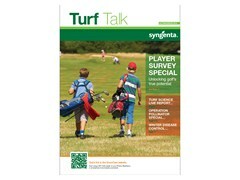 The latest issue of Turf Talk is packed with practical information and ideas to help with turf management decisions this winter, along with insightful articles to plan for the future. 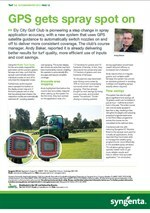 "Innovation drives change for the better," says Peter Todd of The London Club - and Turf Talk ensures you stay at the cutting edge of turf management technology. Click here or on the cover image below to download your pdf copy now. Syngenta Golf Survey Special with the implications for the future of golf clubs' and the role of greenkeepers in ensuring they have a positive future to attract players. 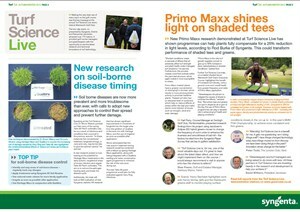 Turf Science Live report on the innovation drives change for the better and that is making a difference for turf management now, and in the future. 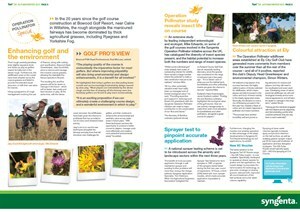 Operation Pollinator special, focussing on some of the greenkeepers that bring the golf course to life - and the techniques that are improving playing conditions as well as the environment. 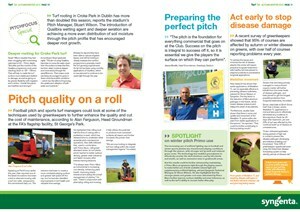 Pitch Focus on some of the innovative new management techniques to create hard wearing surfaces that perform consistently better right through the season. New GPS-guidance spraying technology that automatically gets sprays spot on. 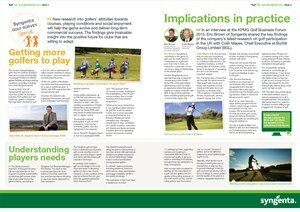 Read the experiences and benefits it is bringing at Ely Golf Club.